To do these kind of discoveries, Sheppard flies across the world to reach the best telescopes he can get his hands on. There's no way around it, as these instruments need to be far from city lights, near an ocean, and high up in the mountains. That's the recipe for the best stargazing conditions. Sheppard's discovery telescopes of choice are the Subaru 8m Telescope at the summit of Mauna Kea, Hawai'i, and the Blanco 4m Telescope in the Atacama Desert of Chile. But his real workhorses are the Carnegie-built twin Magellan 6.5m telescopes, also in Chile and also among the world's biggest. With the Magellan telescopes, Sheppard follows up objects found with the Subaru and Blanco telescopes. But his discoveries can take years of observations to be fully understood, Sheppard says, as small objects in the distant Solar System appear to move very slowly and are very faint when seen from such a distance. Like other astronomers, the price Sheppard pays for his observations is night and darkness. Most people go to bed at night and get up in the morning. "But for observing, you do the exact opposite," Sheppard says. He sits inside the telescope's enclosure observing all night long, usually for several nights in a row. "I just stay up all night until the sun comes up," he says. "It usually requires a lot of coffee." So, upon arrival to a remote observatory—which itself takes a full-day haul from Carnegie's Broad Branch Road Campus in Washington, D.C.—Sheppard switches his sleep habits to night mode. "It's probably the hardest thing to do," he says modestly. 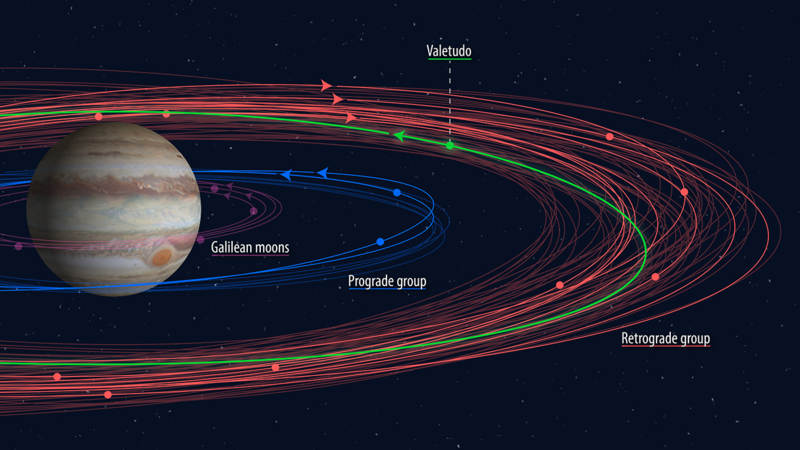 The guy discovered 12 new moons of Jupiter in 2018. A movie of the discovery images of 2018 VG18 "Farout" from the Subaru Telescope on November 10, 2018. Farout moves between the two discovery images (near the center) while the background stars and galaxies do not move over the 1 hour between images. Credit: Scott S. Sheppard/David Tholen. With access to these powerful tools, Sheppard and his colleagues are conducting what he calls the deepest and largest survey ever obtained for distant Solar System objects. "We've covered about 25 percent or so of the interesting sky to date," he says. Pointing the telescopes towards the darkest and coldest places of our Solar System, Sheppard is at the frontier of what we know. "Trans-Plutonian space," he says with an ambitious gaze. Technological advances are finally unraveling the mysteries of the very distant Solar System. Sheppard has been looking in that direction patiently ever since he became interested in astronomy as a subject because of his passion for knowing how planets and their physical features arise. 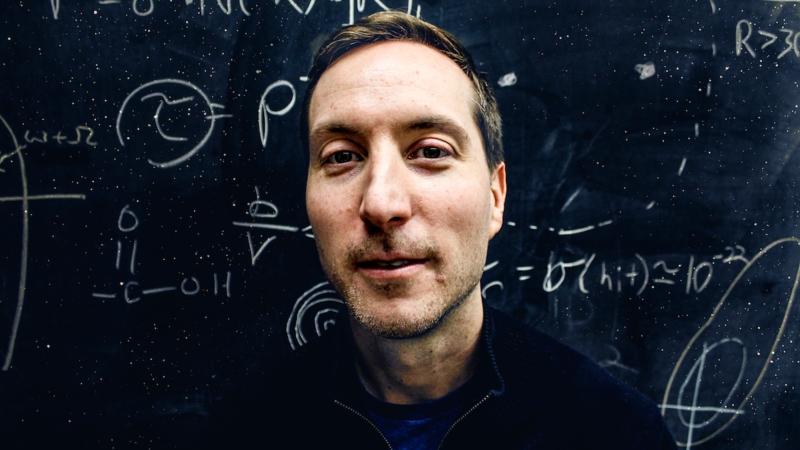 Now a Staff Scientist at DTM, Sheppard searches for objects beyond Neptune and Pluto. "We categorize all these newly discovered distant worlds by their dynamics and physical characteristics to understand how the Solar System evolved, how the planets formed and moved around," he says. Because of their distance from the Sun, the objects Sheppard is hunting for have been in very cold storage since their origin. They are icy comets and other small bodies at the fringe of the Solar System, beyond the circumstellar disc covering the space known as the Kuiper Belt just beyond Neptune and Pluto. "They are likely the most primordial objects in our Solar System, leftovers from the planet formation process," Sheppard says. Far, dark, and icy, the Kuiper Belt starts at about 40 Astronomical Units (or 40 times the Sun-Earth distance). That's a staggering 4 billion miles from the Sun, which means light takes around 5 hours to get there. This Belt of comets, which is made up of objects that never coalesced into a planet and has Pluto as its most massive member, ends around 50 AU. Little is known after the 50 AU mark. While we know there are thousands of objects in the Kuiper Belt, we only actually know of a few dozen objects beyond it. Sheppard's team has found about 80 percent of them, including Farout at around 125 AU. "Understanding the dynamics of these distant objects tells us about how the Solar System formed and evolved over time, as well as how the planets moved around and pushed the smaller objects into deep space," Sheppard says. Sheppard's survey has brought exciting findings. For example, his work has given insight into the planets we see today calmly orbiting our Star. "That wasn't the case in the past," Sheppard says, emphasizing the giant planets. "They probably formed more closely together and pushed each other around in a very chaotic environment." Some of Sheppard's other findings have occurred by a stroke of luck. In summer 2018, an NPR headline read, "Galileo would be stunned," in reference to Sheppard's discovery of new Jupiter moons. He found the moons serendipitously while scanning for distant small bodies in the outer Solar System. Sheppard explained these moons probably formed away from the Jovian giant, before being caught by its massive gravitational pull near the end of the planet formation epoch. He has also discovered other comets and small objects with dynamics pointing to a very chaotic past in our Solar System. Outer moons of Jupiter, with recently discovered moons shown in bold. Sheppard and his team found 11 "normal" outer moons orbiting Jupiter, and odball Valetudo. Unlike the group of inner prograde moons, Valetudo's orbit crosses the retrogrades. Sheppard's discovery brought Jupiter's total number of known moons to a whopping 79—the most of any planet in our Solar System. Credit: Carnegie DTM/Roberto Molar Candanosa. It's not news that the Solar System is selfish with its secrets. But as Sheppard points out, most people probably don't realize how little we know about what's out there. "You can have planet-sized objects—even Super-Earths—in the very distant Solar System that would go easily undetected today," says Sheppard, who also thinks one of the main challenges astronomers face is finding the resources to build cutting-edge telescopes. "There's a lot of unexplored space out there, a lot of sky, and not all that many big telescopes," he says. "To date we have covered maybe a third of the sky for faint distant solar system objects." Sheppard's survey of the deep Solar System started in 2012 with colleagues David Tholen (University of Hawai'i) and Chad Trujillo (Northern Arizona University). They have been very successful with discoveries that include an impressive number of comets, asteroids and dwarf planets, as well as an impressive creativity for naming their finds. In October 2018 they announced the discovery of dwarf planet 2015 TG387, which travels as far out on its orbit as 2,300 Astronomical Units (AU). Such an orbit means the object takes some 35,000 Earth years to complete one orbit around the Sun. The object was dubbed The Goblin. "It has TG in its provisional designation, and we also discovered it near Halloween in 2015," Sheppard said at the time of the announcement. 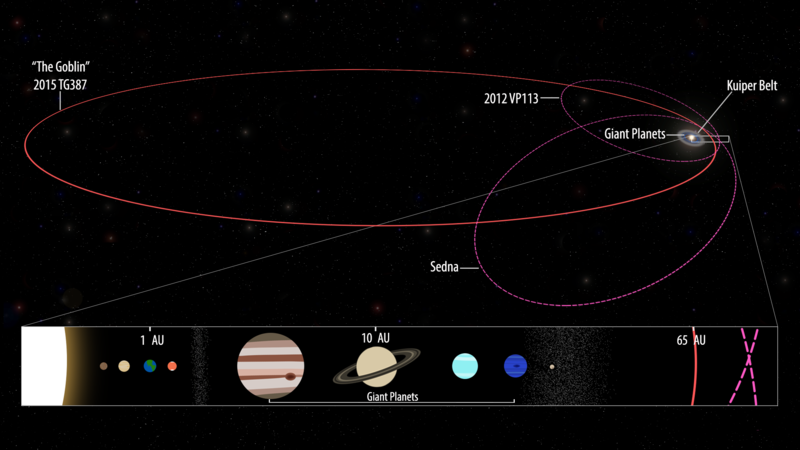 The orbits of the extreme dwarf planet, 2015 TG387, and its fellow Inner Oort Cloud objects, 2012 VP113 and Sedna, as compared with the rest of the Solar System. The Goblin has a larger semi-major axis than either 2012 VP113 or Sedna, which means it travels much farther from the Sun at its most distant point in its orbit (around 2,300 AU). Credit: Carnegie DTM/Roberto Molar Candanosa and Scott Sheppard. In addition to being extremely distant, the objects Sheppard and his team are finding at the fringes of our known Solar System all appear to have similarly elongated orbits aligned toward the same direction. "You just wouldn't expect that," Sheppard says. "You would expect these objects to have fairly random types of orbits." This is the case of Sheppard and Trujillo's 2014 discovery of 2012 VP113, nicknamed "Biden" after the U.S. Vice-President at the time of discovery and the VP in its provisional designation. Most of these distant objects have only been found in a similar part of the sky where they cluster, causing Sheppard and his colleague Chad Trujillo in 2014 to suggest a powerful force is shepherding them into similar orbits. "The best explanation we came up with in 2014 is that a super-Earth to Neptune-size planet over ten times farther out than Pluto is pushing these objects around," Sheppard says. The planet has been labeled as Planet X or Planet Nine by some. Later in 2016, Caltech astronomers confirmed with rigorous numerical simulations that a big planet could be causing the very distant objects observed by Sheppard and colleagues to be aligned in their orbits. This so-called Planet X would need to have an eccentric, inclined orbit at some 200-1500 AU for that to happen. "That's some 10 to 50 times farther than where Pluto is, so very far out there," Sheppard says. "Our ongoing survey continues to suggest there's something big out there at the edge of our solar system." The red oval shows the Planet X orbit prediction of Caltech's Batygin and Brown (2016). 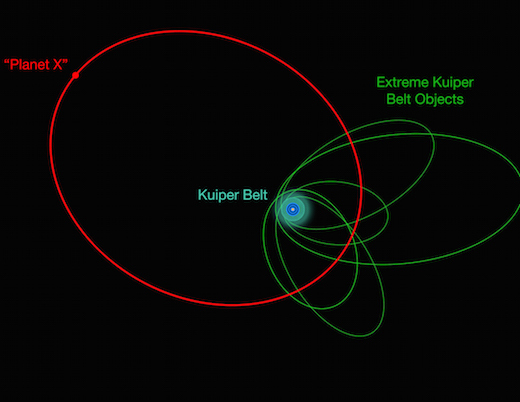 The green ovals are the small extreme Kuiper Belt objects that Sheppard and Trujillo first used to identify "Planet X" through its gravitational interactions on the objects. The light blue dotted circle is the Kuiper Belt. The dark blue circles are the known giant planets. Credit: Carnegie DTM/Scott Sheppard. "Elusive" might be the descriptor most associated with Planet X. That's synonym for evasive, mysterious, hard to find. The planet is exceptionally good at playing hide-and-seek because of three main reasons. First, its size, which could make it too faint to detect with today's telescopes. The planet could be just a bit larger than Earth, or gigantic like Neptune. Second is its distance. Sheppard is looking for it at the fringes of the known Solar System, but he doesn't really know whether it is 10 or 50 times farther out than Pluto. If the planet is on the far edge, it could be nearly impossible to spot with our telescopes. And third: we don't really know much about its reflectivity. "Does it have an atmosphere and clouds?" Sheppard wonders. "We don't know if it's dark as coal or bright as snow." The planet could be quite bright and readily detectable, or quite faint and thus beyond our current technology's reach. Yet nothing about Sheppard's discoveries suggests the hunt for Planet X should stop. While the planet itself might be at the edge of our imaging abilities, Sheppard is determined to find more and more extremely distant small objects. That's what might end up leading him to the planet. "We can look at the statistics of their orbital dynamics, look at the clustering of those smaller objects, and narrow down where the planet could be," he says. If Sheppard and his team are able to narrow down that area, they could systematically focus their resources and bring in the heavy observational artillery. "Most likely it's in the middle range of three specifications: medium size, moderate distance, and average reflectivity," he says. "If that's true, it should be detectable by our largest telescopes." 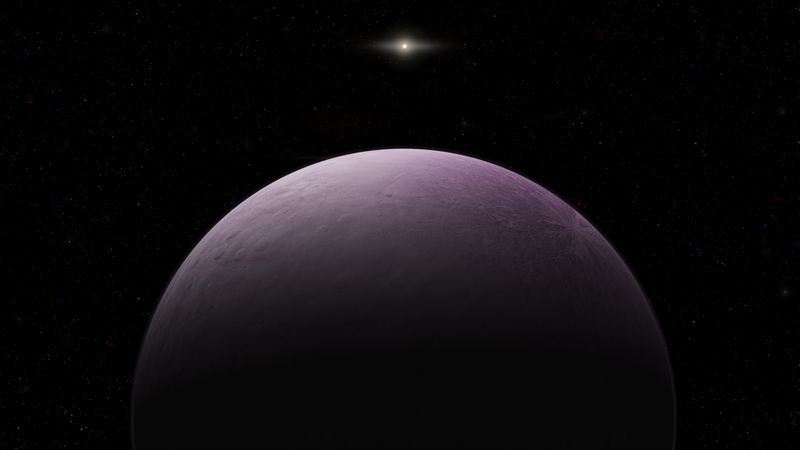 An artist's conception of a distant Solar System Planet X, which could be shaping the orbits of smaller extremely distant outer Solar System objects. Credit: Carnegie DTM/Roberto Molar Candanosa and Scott Sheppard. Finding the planet wouldn't just add a new member to our Solar System family. It would change everything we know about our family history. 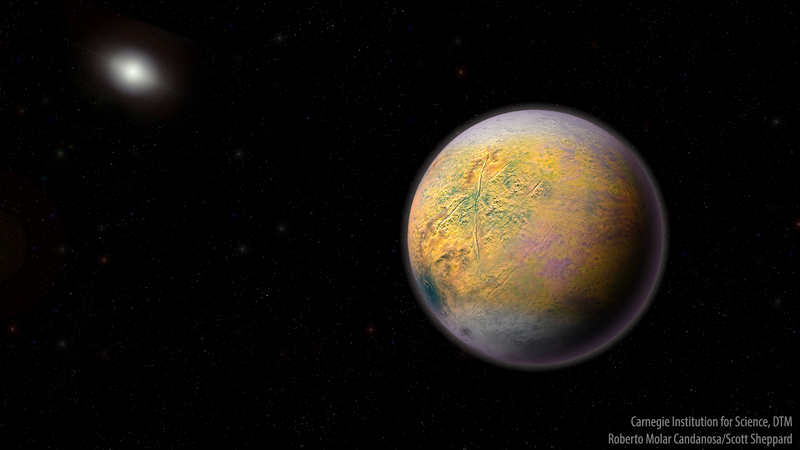 Astronomers agree that things the size of Planet X can't form out where Pluto is or beyond. That far out, things are sparse. Also, the volume of space is large and only small things form (think Pluto, which is smaller than our Moon). "We believe these smaller objects couldn't form out there, that they were scattered out during the chaotic early history of our Solar System billions of years ago," Sheppard says. Same goes for the missing planet. "Even more chaotic if this planet exists and formed in the giant planet region and then was thrown outwards," Sheppard says. Had Planet X been thrown inwards, it would've destroyed Earth and the other rocky planets we know. Life as we know it might not exist simply from a random scattering event that could have occurred billions of years ago. All of these unknowns can only mean one thing for sure, and that's more long nights to come at the observatory. That includes over 24 hours of travel across the world and switching to night shifts every month or two. "The observing kind of controls when I'm sleeping and when I'm not," Sheppard says with a smile. Finding the missing planet might steal some of Sheppard's sleep, but regardless of how difficult it might be to spot, the hunt goes on. "Sometimes you think there's a lot of sky out there and you just think that maybe we won't find it," he says. "The only way to find out is to try."